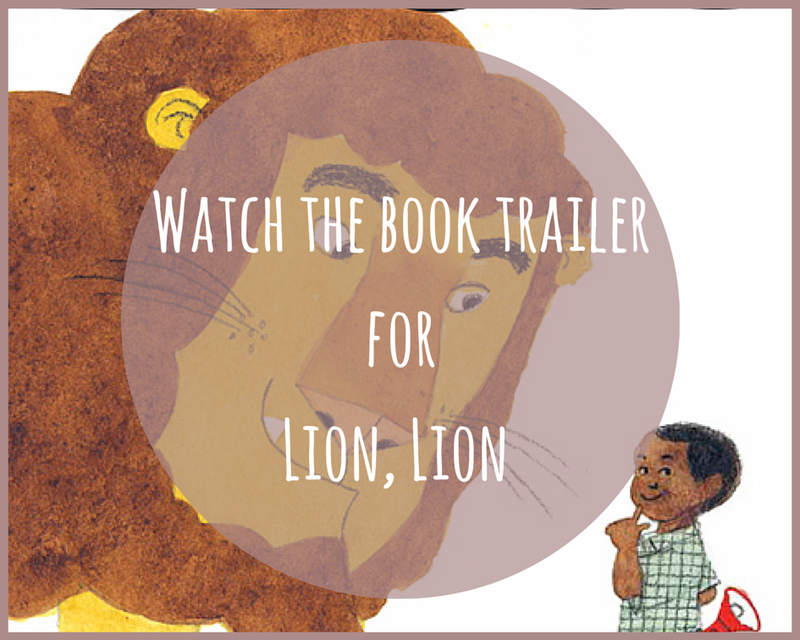 Miriam Busch, Larry Day, and I are celebrating Lion, Lion's book birthday and book trailer. Are you ready to press play? Scenario: You’re shopping at Anderson’s Bookshop in Naperville, Illinois, when you spot someone looking at a copy of Lion, Lion. You decide to deliver a book talk. Ready! Set! GO! Larry: I’d say, Hey, that’s me! And that’s my wife! This is a story of an ingenious little boy searching for something, who outwits a lion to get what he wants. This tale plays out like a mystery. I like how the boy starts right out of the gate with wits-at-hand, and takes the lion and the readers on a rollicking journey. It’s a story about friendship, loyalty, and sticking together against all odds. Miriam: One of my favorite things about this story is that everyone is talking at cross-purposes. Nothing is quite what it seems. You have to look closely at the pictures AND the words to figure out what everyone is REALLY saying. And when you do, when you come to the surprise, it all makes sense! Miriam, I love that you dedicated Lion, Lion to Larry. Larry, I love that you dedicated Lion, Lion to Miriam. 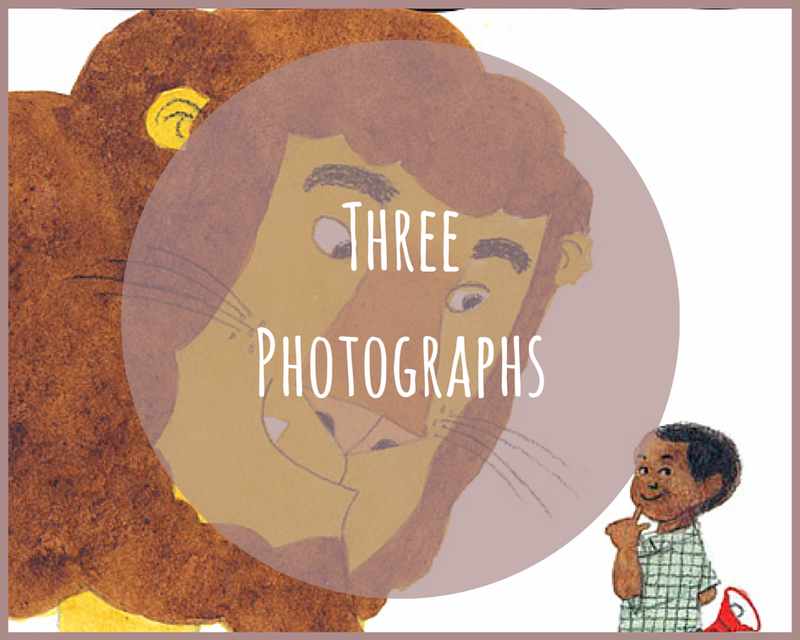 As you know, it is rare for an author and an illustrator to work together on a picture book. Can you tell us a little about how you collaborated on the book? Miriam: This book began as a glimmer of an idea. 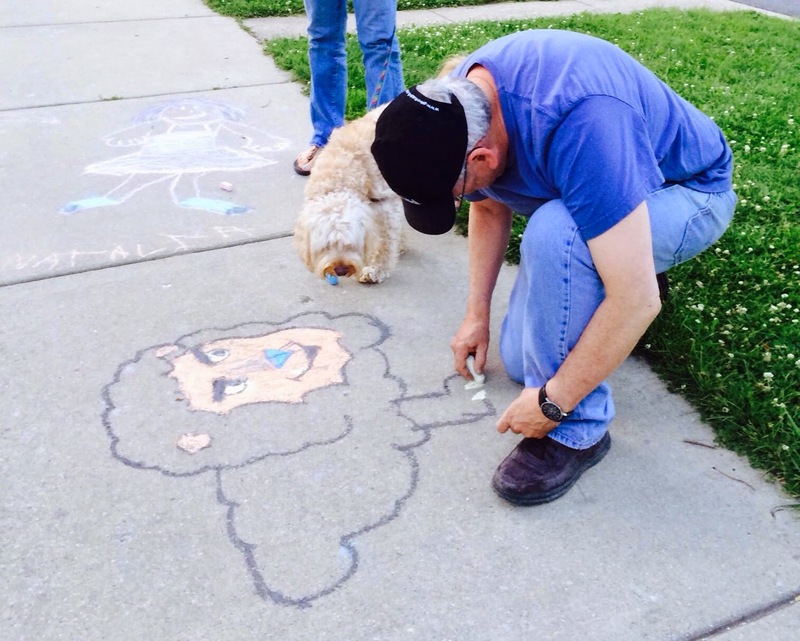 Larry had drawn a character he wanted to base a story upon. We worked on it, but that initial idea and character fell by the wayside. Still, we kept working – we have so much fun making stuff up together! We often use breakfast-time to play with story ideas. For Lion Lion, we met in diners. (I love a booth.) We sat across from each other and passed paper and pen back and forth between hash browns and orange juice and coffee. Larry thumb-nailed (on napkins, on backs of receipts, even sometimes in a sketchbook) and we played the what-if game. Sometimes I wrote in his sketchbooks, or even sketched (!) (Don’t ask). After breakfasts, we both went off to our day-jobs; for our final year of back and forth on this book, I was in school. Still, whenever an idea made sense to us both, I typed up a fresh manuscript, and together we played with page turns and different characters. Often, Larry’s drawings made my words unnecessary, and we trimmed words and added story to the pictures until we and our editor (Alessandra Balzer) were satisfied. Through this whole process, Larry always asked what I thought of the character’s expressions and listened to countless minute text shifts as I read them aloud. 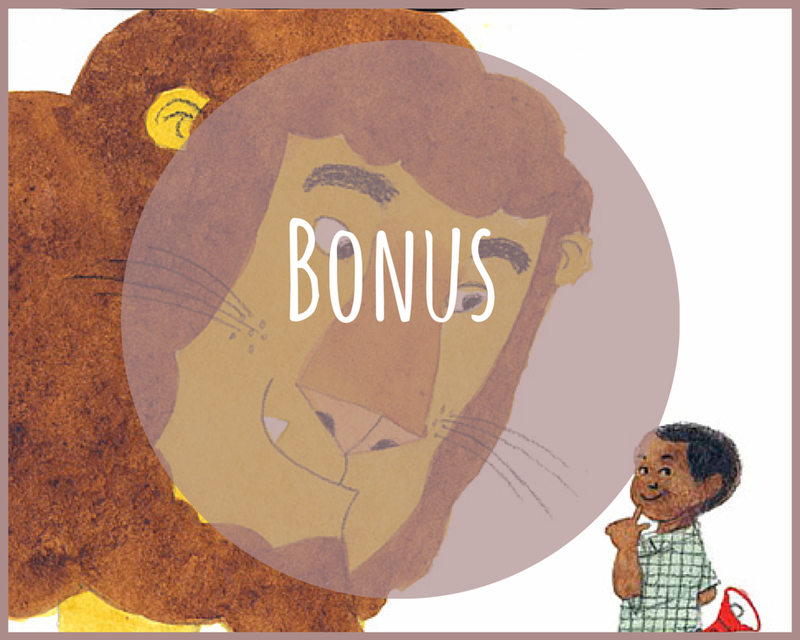 What do you hope young readers say when they finish reading the last page of Lion, Lion? Miriam: I hope, very much, that they say, “Read it again!” I also hope that they have fun making up stories about what happens next. When you were the little boy’s age, what books did you love reading and re-reading? Larry: I loved Ferdinand. My mother had a hardcover edition that I pored over. I don’t recall ever going to the library, and every other picture book we had was dull to me. 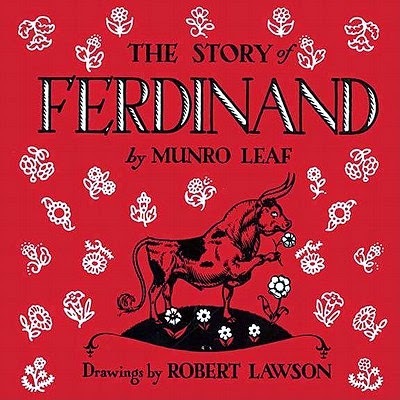 To me, Ferdinand, besides being a terrific story, was about Lawson’s art. His ink drawings were deceptively simple. His strong compositions, variety of textures, and Ferdinand’s body language—all this told me the story. Miriam: I loved a French book – I think it was titled Le Petit Chien, but I could be misremembering. The illustrations were simple pen and ink. A tiny dog saves his friend from a crocodile by pulling a dinosaur bone from a museum exhibit... it was very funny to me. The carefully constructed skeleton winds up in a total heap, and the dog happily goes about his day. Disclaimer: this is my memory – not sure of the accuracy. If any of your readers knows this book, I’d be so grateful! Please share a handful of recently published books that you’re wild about! We both love these: If You Want to See a Whale, by Julie Fogliano, Ill. by Erin Stead. Big Bug by Henry Cole. Farmer Will Allen and the Growing Table by Jacqueline Briggs Martin, Ill by Eric Shabazz Larkin. Unspoken by Henry Cole. Behold, The Beautiful Dung Beetle by Cheryl Bardoe, Ill. by Alan Marks. For middle grade: The Real Boy by Anne Ursu. Miriam: I’m far behind in my reading on recent books, and my TBR list goes on for miles! So, the following list shows you how far behind I am, but here goes. In addition to the above, here are some YA I am wild about Far, Far Away by Tom McNeal. The Family Romanov by Candace Fleming. Poisoned Apples by Christine Heppermann. All the Truth That's In Me by Julie Berry. Larry: Ten Orange Pumpkins by Stephan Savage, Fog Island by Tomi Ungerer, Peggy by Anna Walker, and The Mighty Lalouche by Matthew Olshan. Please finish these sentence starters. Miriam: Picture books are different animal from any other type of book. They are layered in meaning, and I love that a pre-reader can “read” the pictures while a reader reads the words. The cinematic magic of a great page turn always knocks my socks off. I read and reread for that magic. Larry: Picture books are like a circus clown car where you know that a herd of clowns will pour out of a tiny car. Every time, it’s always the same, except different clowns, maybe a different car. Picture books are predictable. Every time after the first time, a child knows what will happen on the next page turn. Picture books stay with you throughout your life. As you get older, the meaning changes as you think of the story in different ways. Miriam: Reading is necessary. Like breathing. Also, reading is like a mini-vacation: helps me get perspective, and it’s also one of my favorite ways to relax. Larry: Reading is like an iceberg. Once you start reading, the story opens up below the surface. It’s a away of engaging in the world around us. Mr. Schu, you should have asked us about our dog, Lucy. She is very involved. She loves a good story, too. And here is Lucy with Miriam and Lion Lion! Thank you for visiting Watch. Connect. Read. I hope you have a WONDERFUL book birthday! I am giving away a copy of Lion, Lion. 1. It will run from 9/30 to 11:59 p.m. on 10/1. 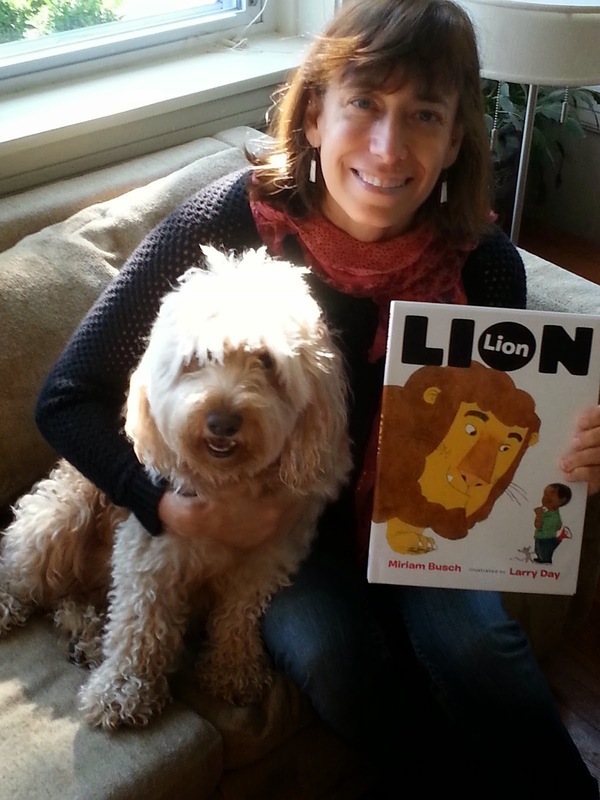 Borrow Lion, Lion from your school or public library. Whenever possible, please support independent bookshops. 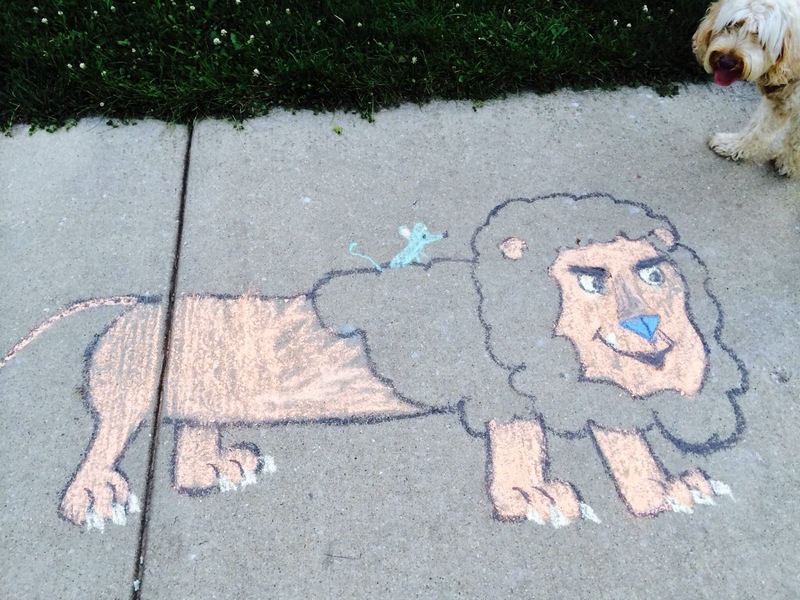 Travis Jonker featured Lion, Lion today, too.